Moving to a different country, having trouble finding someone to take care of our pet during a holiday or simply wanting to share our trip with your pet friend? Moving to a different country, having trouble finding someone to take care of our pet during a holiday or a business trip abroad, or simply wanting to share our trip with your pet friend - taking our beloved animals along when we travel could be a complicated feat if we fail to get the right information on the requirements related to international pet movement. So let us get started on a general overview of what to do when we are planning to take our pets abroad. Most of the countries have their specific rules regarding the import of animals which is necessitated by the desire to prevent pets from spreading contaminations and viruses. The carriers have their own pet travel policies too. This is why the best approach to travelling with a pet is planning the journey well in advance so that all the necessary vaccines and health certificates could be within time. There might also be special rules regarding the number of pets allowed to be brought into certain countries, as well as limitations related to pets brought into a country on a private boat or a plane, so check this out too. Other specific procedures entailed in pet movement are microchipping and vaccination. The most common potential animal diseases required to be handled are rabies and treatment against tapeworm. Keep in mind that before you subject your pet to rabies vaccination, you should have it microchipped. You have to make sure that the microchip’s number is recorded on your pet’s passport or the official veterinary certificate. Microchips are mandatory for pets travelling in the EU. While transport companies in the EU can read microchips that meet the standardized 15-digit microchips, when your pet’s chip does not meet the standard you should be equipped with your own chip reader. Another popular type of marking of your pet – a tattoo with an identification number, could exempt you from microchipping, but only if your animal was tattooed before July 3rd, 2011, the tattoo is clearly legible and the pet was vaccinated against rabies after it was tattooed. In case you fail to accomplish any of the pet import requirements of the foreign country you are heading to, there are different punitive measures provided. A common one is placing your pet under quarantine, but there are harsher provisions too. So, once again make sure you and your pet friend have it all right beforehand. Naturally, the more common types of pets are easier to transport. Most of the general pet movement rules apply to cats, dogs and ferrets. The requirements related to the transportation of more exotic animals such as primates, big cats, or reptiles raised as pets are much stricter. Many of the countries indeed prohibit the import of reptiles and shelled animals. Some curious and irrational facts - New Zealand, which is a snake-free country, does not allow any reptile pets entering its territory. And the USA has specific requirement to the number of tortoises and the size of their shells. When flying our pets we should find out the pet movement policy of our carrier, including the duration and the type of flights, as changing flights for instance could cause distress and anxiety in the pets. Different airlines have different pet policies. Some allow pets in the cabin, others allow them only in the cargo, still others have a no-pet policy. When considering flying with more common pets, such as dogs and cats, you should beware several additional things such as the fact that under the Animal Welfare Act you are not allowed to fly with your pet unless it is older than eight weeks. Our tiny friends should be off lactating for at least five days before heading on their first plane flight. Another important consideration is booking the flight of the pet at the same time you book your own flight, preferably well in advance, since the airlines are allowed to transport only a limited number of animals per flight. 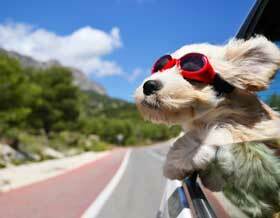 Make sure that either you or your travel agency makes a timely booking for your pet companion. You should also research the crate requirements as there are pet carrier size regulations that differ with every company. And last but not least, try to make your pet’s crate as comfortable as possible and pay special attention to its access to water during the flight. You could insure your pet when you travel both when it is with you and when it stays at home. There are plenty of companies that offer pet travel insurance so choose the conditions that suit your pet and your destination best and go for it. It turns out that taking a pet along while travelling is a complex matter. Though the process with all its requirements might sound cumbersome and complicated, bringing our pet friends along while travelling is a project that could be broken down into small steps when planned well ahead. As with other things in life, no pain, no gain, so if having our pets by our side abroad is worth it, the above tips could be used for planning a safe pet transportation and entrance into our destination country.